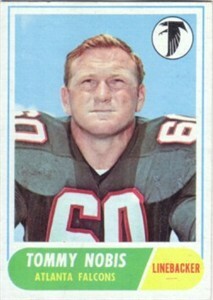 1968 Topps card of former Atlanta Falcons Pro Bowl linebacker Tommy Nobis (#151). NrMt condition (has four sharp corners but there is a tiny notch on top left edge). ONLY ONE AVAILABLE FOR SALE.